Every year, friends and family gather around the roasted turkey beautifully displayed on the dinner table on December 25th. And more often than not, it's the result of hours of hard-work, slaving over a hot oven. But what if we told you THIS year you don't have to cook your own Christmas dinner!? The beauty of life in Dubai means 5* hotels and restaurants will actually cook your turkey - AND all the trimmings - for you, so you don't have to waste hours of your Christmas day in the kitchen. So instead for Christmas 2018 in Dubai this year, why not opt for a turk-away, and have your Christmas dinner prepped and ready for you by the pros instead? It's the season of giving! Save the stress of cooking and enjoy a wonderful Christmas hamper or a roast Christmas turkey with all the trimmings, thanks to Ramada Chelsea Hotel in Al Barsha. The hamper is priced at AED 125, and includes a Christmas plum cake, traditional German stollen bread, homemade Christmas cookies, a dundee cake, mince pie, panettone bread and a box of chocolates. The turk-away offer includes a 4.5 - 5kg turkey that serves 8 to 10 people - it comes with a tray complete with stuffing, seasonal veg, roast potatoes, cherry tomato confit and natural gravy. The best part? It costs just AED 249. Take the stress out of cooking this Christmas and order your turk-away from the Grand Millennium Hotel Dubai - they'll prepare a mouth-watering Christmas roast turkey hamper with all the stuffing and trimmings you could dream of for just AED 499. There's enough to serve 10 - 12 people! Feast on a delicious festive turkey with all the trimmings from the 5* Jood Palace Hotel for just AED 325! The deal includes a 5kg - 6kg turkey, grilled veg, turkey gravy, cranberry sauce, chestnut stuffing - INSIDE the turkey! - pigs in blankets, mashed potatoes and a Christmas pudding to finish. Take home a delicious roasted turkey and stand a chance to WIN a 2 night-stay in Turkey this festive season, thanks to Arjaan by Rotana. 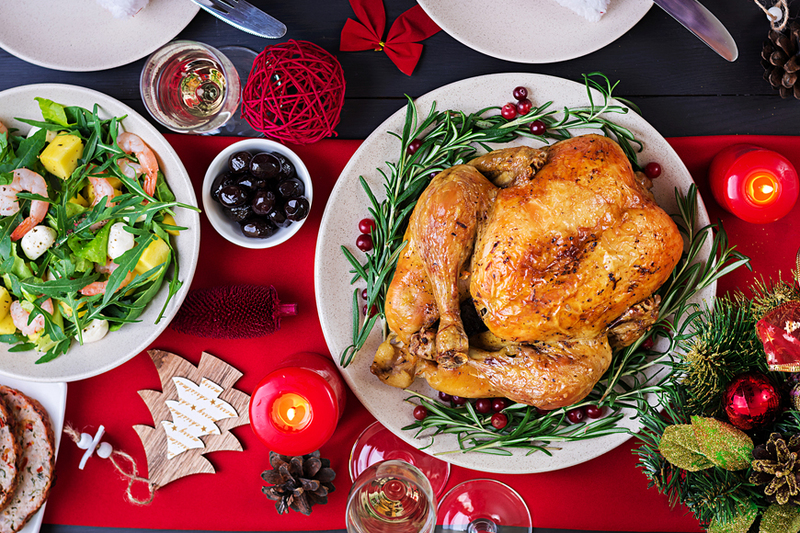 Opt for a Christmas roast turkey that weighs 5kg - 6kg with trimmings for just AED 399 or for an additional AED 100, increase the size of the bird and choose a 6kg - 7kg turkey. The package includes a chestnut and sage stuffing, roasted potatoes, brussels sprouts, winter vegetables and cranberry sauce and gravy. Instead of picking up your turk-away, have it DELIVERED to you instead! Opt for a 4kg (AED 349), 6kg (AED 525) or 8kg (AED 695) turkey to be delivered to your home for Christmas Day from Crowne Plaza Dubai. The deal includes stuffing, trimmings and sauce too! There is a delivery charge of AED 80 though for Dubai and Sharjah.